The decade of the 1970s on the Lower East Side (LES) was a vibrant and fertile period in the annals of latin music history. Not only was the area rich with live music venues but it also produced a substantial number of popular latin ensembles and successful solo artists. Puerto Rican culture and artistic expression seemed to permeate just about every aspect of LES life during those special years. Back then, it was not uncommon for a person to walk out of their tenement apartment and be treated to the live sounds of musicians like Ray Barreto, Joe Bataan, Típica '73, or even Eddie Palmieri performing on the Jazzmobile. I can recall one occasion in particular when I had the good fortune of witnessing Héctor Lavoe perform one of his block-party serenades to a couple of giggling young Pentecostal women who were taking in the sounds of the Willie Colón orchestra from their 3rd floor fire-escape balcony. Those were the days when you could see real joy in the people's faces as they shared in the celebration of that special community! Without a doubt, the rhythmic pulse of Loisaida was quite a tangible phenomena. Electricity flowed throughout that culturally rich neighborhood bringing together people of different backgrounds and ages. The memories I have of those extraordinary days are quite unique and always seem to bring back to mind my first real encounter with live latin music. I was still in my teens when I first saw the Eddie Palmieri Orchestra performing on the Jazzmobile truck. It was a hot summer's afternoon on East 6th Street (Avenue C) and I remember watching in awe as the band worked itself into a rocking frenzy during a sizzling performance of La Malanga. The hypnotic sway of the Jazzmobile stage created by the band's explosive energy had the listeners mesmerised. The crowd appeared to meld together, moving in rhythmic unison as Chocolate Armenteros soloed saliently above the band's orchestral spewings of vintage Palmierian contrapuntal swing. As the flatbed drove off, la gente jubilantly followed the ornate iron float like a trail of colorful smoke dissolving into a puff of magic dust. That extraordinary day felt like a utopian fantasy; there were no signs of misery, tension or poverty on Avenue C that afternoon, only an atmosphere of collective merriment. Loisaida's music and musicians were all part of the intricate encaje of the sur-este. That wondrous area was sprinkled with the talents of such distinctive artists as Ismael Miranda and Markolino Dimond (who could be heard practicing his Brujeria on East 13th street). A couple of doors down from Mark's place you could witness latin music history in the making as they filmed Orchestra Harlow performing their latest recording atop a concrete stoop for the movie "Our Latin Thing". Loisaida was also host to many spontaneous (and creative) sessions that took place in a variety of places such as store fronts, roof tops, street corners, church vestibules, park benches and dirt basements. Many of those informal get-togethers resulted in the creative works of such groups as Sublime, La Flamboyán, Conjunto Saoco, Frank Bello Y Su Charanga, Yambú, Tambó, Cimarrón, Sociedad '76 Ralphi Santi, and the René Gran Combo. During the 70s, Avenue D and 11th Street was also fast becoming una plaza de rumbones complete with weekly jam sessions and philosophical street-bench forums. On any given day you could catch some of the members of Sublime, Andy Harlow, Saoco or Los Kimbos jamming together in the plaza accompanied by the likes of Tato Laviera and Sammy Tanco on coro, cans and clave. Lamp posts provided electrical power for baby bass amplification as well as Ray Santiago's piano (which, incidentally, could be heard for blocks as well as from his mom's kitchen window). The neighborhood also had its own latin music center - the Third Street Music Settlement. Through the tireless efforts of a young musician by the name of Ramón Rodríguez (who at that time was both program administrator and director of Orchestra Yambú), the neighborhood was afforded its own learning center for latin music studies. The school, which employed instructors such as Louis Bauzo (Orchestra Tambó), Dave Chamberlain (Tambó), Johnny Almendra (Tambó), Ron Davis (Orchestra Cimarrón) and Milton Hamilton (Orchestra Yambú) produced a number of notable percussionists like Jaime Delgado, Eddie Montes, Pete Gómez and Rey Alcántara. Years later, the program was transformed into the Boys' Harbor Music School and moved into El Barrio. The weekly jam sessions had a great impact on many of the area's younger musicians because they brought together both aficionados and professionals in an informal performance setting. The younger players not only got a chance to listen and dialogue with the more seasoned musicians but were also afforded the opportunity to participate in the jams. More importantly, musicians shared information and resources at these sessions and often referred the younger players to the Settlement for formal music instruction as well as gigs. In time, the plaza jams gradually evolved into mini drum clinics that generated a substantial interest in latin music throughout the neighborhood. The sessions worked in conjunction with the music school in showcasing the music and promoting hispanic culture within Loisaida. Those unique forums had an undeniable and often indelible impact on many of the local youth. The place to be in Loisaida on Sunday afternoons was at the bank of the East River on South Street (under the FDR drive). That was where informal summer week-end fairs took place providing local residents with a taste of Guavate and its alcapurrias, fri-itas and live music. There, one could go to relax, converse, dance, play dominoes or just reminisce to the melodic rhythms of the legendary tresista/composer Mario Hernández and his sonorous "vente tú". Club hopping was another popular activity during that period in Loisaida. One could catch El Conjunto Saoco at the Lismar Lounge then easily walk over to the Godfather II Club, the Chaphouse or Del Monte to listen to the sounds of bands like Típica New York, Cimarrón (with Rafael DeJesús) or Pipo Vélez' Quinteto Del Monte. On East 14th street, you could experience the swing of the Eddie Palmieri Orchestra at La Mancha or Tito Puente at Casino 14 (which ironically was located in the same spot where the new Virgin Records Megastore that sells those very artists' recordings now stands). Casa Galicia, which was another popular night spot located on East 11th street, catered to an older crowd and featured such popular orchestras as the René Gran Combo. During that same period, the New Rican Village club (Nuyorican Poets Cafe) opened on Avenue A (between 6th and 7th Street) and began sponsoring musicians like the González brothers of Conjunto Libre. Featured artists at the club included performers like Miguel Algarín and the late Eddie Figueroa. "El Coco que habla" was another popular fixture on the street of Loisaida, often reciting his poetic verses at sidewalk forums. Around that same period, Bimbo Rivas could be found hopping from forum to jams with his compatriota - Angel, el trombonista/conguero, as he spread his philosophical tidbits and humor. Loisaida also had its own quintessential plenero during that era El Amable Gigante, who was seldom seen in the neighborhood without his pandereta in hand as he played and sang his enchanting jíbaro songs. And then there was Chino Campos, who painted neighborhood murals when he was not sculpting cork or playing his flurried conga solos in Tompkins Square Park. Artists like Henry Fiol also contributed to the tenement canvas with his paint brushes when he wasn't honing his guaguanco in street jams or promoting his "art on drums". The vibrancy of that culturally rich neighborhood could be felt and heard all over. On any given day, you could walk down one of those short avenues and catch the rhythm section of the late Frank Malabé, Nicky Marrero and Reynaldo Alcántara rehearsing for a session or hear Luisito Ayala soloing on gazoo to the incendiary Mayarí in a jammed-packed storefront social club. Second Avenue resonated with by the thunderous sounds of the late Eddie Colón's trap set (who alternated his work schedule with acts like Larry Harlow, Nona Hendrix and Al DiMeola). A few block over, Flamboyán leader Frankie Dante could also be seen discussing his latest project with Markolino on First Avenue while Johnny Pacheco was in the middle of filming the movie Our Latin Thing in an East 6th street lot (just a few doors down from the legendary Godfather II movie set). Of the many memories I have of growing up on the Lower East Side of Manhattan, my favorite ones recall the lazy, hazy days of summer spent in pursuit of playing ball. Whether it was wiffle ball, punch ball, off the barrel, off the bench, off the wall, off the point or stickball, it seemed I just couldn't get enough . I would play from sunup to sundown, if permitted, with periodic times of eating (I virtually inhaled my food!) just to refuel. I remember having to suspend a one on one game of off the bench with my best buddy Pete Cordero due to darkness.We resumed play the next day and I was the eventual victor in that 56 inning marathon! We took our "off the bench" games seriously in those days. We even had matching uniform T-shirts with numbers on the back. My team was made up of Joe Povlosky, Michael Podlofsky, Willie Marrero and myself. Mike was the middle fielder, I played first base, Willie and Joe were our outfielders. Our perennial opposition was a team of neighbors Ralph, Bobby, Berto and Georgie. A typical Saturday morning found us at Rosie's candy store looking for the best Spalding rubber ball available (the bouncier the better). After choosing one we headed to our field which was the asphalt between 108 and 118 Avenue D.
It was a perfect field for our game. The trees and other obstacles just happened to be at just the right spots to mark off the fair and foul areas. The size was just right for four players and the distance to the fence for a home run was neither too easy nor too difficult. The only drawback was that we had frequent interruptions due to pedestrian traffic. After the game we would review our statistics, usually over some soda and chips . Michael, who we considered our 'smartest' player would tell us our batting average, hits, HRs , etc. Occasionally our "team" would travel to the Yankee Stadium in the Bronx. I clearly remember the first glimpse of green I got from the elevated platform of the #4 train. It looked so beautiful it took my breath away. I had never seen such a perfect field. I had played on the sandlot fields in the East River Park but they could not compare to the beauty of the Yankee Stadium diamond. It would be the fulfillment of a dream to play on such a field. This January 1999 I fulfilled that dream. I traveled to the Yankees spring training facility in Tampa, Florida and played at their Legends Field. If you look around quickly and disregard the palm trees you would think you are in the Bronx. The seats are the same, the distinctive facade is the same, the field dimensions are the same. You would think you are in Yankee Stadium. The public address system announces "NOW BATTING, PLAYING SECOND BASE, PARD CHAN". On the scoreboard in center field I can see my picture as I walk up to the plate. I can't let that distract me. lt's my turn to bat and I'm up against one of the Yankees most feared relievers of all time, Goose Gossage. He has already struck out four of the first five batters. STRIKE! yells the umpire as I look at the ball whizzing by. My heart is now beating rapidly as the adrenaline kicks in. My eyes focus sharply on Goose's hand as he starts the windup and I coil into my launch position ready for the next pitch. Here it comes.... CRACK!!! I hit it hard but got on top of it just a little bit. As the shortstop fields it, I know I'11 be out at first, but it was a victory just to hit it. Illumination abounds on the hard cement streets of our new village. Chatter of microchips and grunge sprinkled with profane attitudes fill the atmosphere on a grey but crisp day. You can smell the scent of curry mixing with the aroma of incense and greasy chicken and fries as you dodge the backed-up street traffic that adds its' own pungent ingredient to that all important mixture, the air of life! From afar, you witness a practised hand working a stranger's pocket while a pubescent love scene unravels right before your very eyes - all within the same frame of vision? Ah! The blissful innocence of puppy love flourishing amidst the shrubbery of that unique concrete jungle. After dismounting the genuflecting bus, I walk past a kaleidoscopically lit Tibetan shop replete with brilliantly stimulating mandalas that cohabitates two doors down in that Eden of Rock with a bombastically colorful neon-draped liquor store. I continue my journey up two blocks and find myself in front of the central building of that infamous neighborhood's beatified artery, world known for its' artistic fertility. At first glance, the building appears to resemble a bee swamped honey comb buzzing with danger. As I cross the street to my destination, the atmosphere is filled with crashing cymbals, the sound of distorted steel and deep bass rumblings. A couple of suits, awaiting their weekly haircuts, negotiate a sidewalk deal for a new - "super hot" - european bike. I too am awaiting my haircut as I hear their deal fall through because "$160 does not equal $250" and "K-Mart up the block has new bikes for $99" (sans the clipped chain, of course!). Oh well, no deal . "Next!" calls out the barber. Una de las herencias mas bonitas e importantes que les dejamos a los hijos es nuestro idioma. Sin embargo, nuestros hijos, criados en este país, parecen rechazar este legado. Los primeros años de la vida del niño pasan sin incidentes, en la normalidad que compone un hogar hispano. El español predomina en el habla, recalcado por la cultura y la práctica de las costumbres de nuestros países latinos. Luego llega el momento en que los niños comienzan a conocer el mundo. Se ven expuestos por todos los lados al inglés. Nos alegramos de que adquieran soltura y fluidez en ese otro idioma, mas el problema surge poco a poco cuando los niños van adaptándose a ese mundo fuera del hogar. Ahora los amiguitos, la escuela, el cine, los libros, son parte de ese mundo anglosajón. Cuando nos damos cuenta, las cosas han cambiado mucho. Les hablamos en español a los niños-nos contestan en inglés. Prefieren todos los programas de televisión menos los que presenta el canal hispano. Preguntan, ¿por qué hay que escuchar 'Spanish music'? Hasta nos echan en cara nuestro acento al hablar inglés. who spent most of his life showcasing el j�baro borinque�o. Very early on, he set out to promote his homeland and celebrate his puertorrique�idad through his performances of such Puerto Rican folk song forms as the d�cima, the aguinaldo and the plena-bomba. But dreams like a man. As youngsters we all recall juxtaposing Domino pieces inches apart in a straight line or a finite curve, depending on the number of blocks available, then being fascinated by the ripple effect created as we tapped the first piece to begin a continuous fall. These small rectangular pieces of wood or ivory, each identified by a number of dots (or pips) on their face, are commonly referred to as bones. This was my first experience with the Domino Effect. It is best defined as the problem of failing systems; if one system fails while another is interdependent on it, that system also collapses. In politics, the Domino Effect represents a country falling to communism (or other form of government) after a neighboring country has also succumbed to communism. Another example would be the effects of an epidemic on a population (i.e. widespread fatalities resulting from the collapse of a system resulting from the failure of the environment to maintain itself in balance). The other Domino effect, not associated with any of the above definitions, is a personal attraction I have for visiting, with camera in hand, Plaza Hostos at the foot of Paseo de La Princesa (in Old San Juan). Here, for many years, men both young and old have played their daily game of Dominoes. On any given day, one, two, or as many as four games will be played simultaneously. This slow paced game which perhaps started in China around the 12th century AD is very popular in the Caribbean. Every trip to Old San Juan invariably takes me to Plaza Hostos. Luxury Cruise liners dock near there at Calle La Marina discharging thousands of foreign and mainland visitors intent on visiting the local shop and basking in the sun drenched beaches. The area's famous Piña Coladas and Rum and Cokes await them at the many hotels. But, one activity they will surely observe on their way to the Old San Juan shops are the various games of Dominoes taking place. No, not at the Hiram Bithorn or the Roberto Clemente Coliseum; these venues are reserved for the Winter Baseball League and Jazz & Salsa Concerts. Instead, they will eventually reach Plaza Hostos where they will not see any professional salaried players as members of an organized league but catch the all engrosing domino marathons! Dominoes are a people's game mostly played by elderly and middle aged men; although, I recently witnessed some younger men curiously standing by and participating. These games take on a life of their own through the heated arguments and name calling that always seems to ensue. Intense concentration and of course, the ever present banter between the players is a mainstay. Tourist stand by to enjoy the frenzied exchanges, scorekeeping, zestful arguments and that hard banging of domino pieces on the play table that adds fire to the event. The old men prefer to call it a sport and I tend to agree because competition, concentration and emotional & physical pain, like any sport, gives it validity to be so called. They were extremely kind and gave me their permission and blessings. As I took my shots, I was fascinated more by the men who played the game than by the game itself. I enjoyed witnessing those wise men playing that age-old game with such honest enthusiasm. They laughed at each others banter and diligently kept an accurate scoresheet. I noticed that the domino pieces were not created from the finest ivory, but, of fine wood and the scent of fresh fruit from the nearby vendors was ever-present As the game progressed, the "piragüeros'' and souvenir vendors looked on as I took more shots. I finally followed the tourists to Old San Juan for that cold rum & coke. Dominoes is a big part of our culture on the Island. Go to any town in Puerto Rico and you will probably come across a table of four playing the game. The young seem to have finally caught on to the phenomena and display strong pride in following in the footsteps of their fathers and grandfathers. 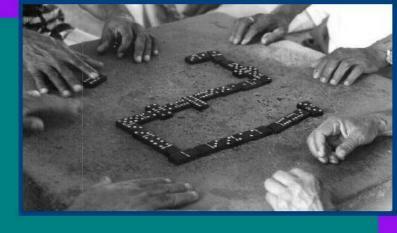 For this reason, they must be admired for continuing that age old tradition that we call the sport of dominoes. No hay peor sordo que quién no quiere escuchar. Mas vale tarde qué nunca. El qué mucho abarca poco aprieta. Es el mismo jíbaro en diferente caballo. El único amigo es un peso en el bolsillo. Arbol que nace dobla'o, jamás su tronco endereza. Esos son gustos que merecen palos. Está mas jala'o que un timbre de guagua. Es mas maceta que una macana de guardia. Está mas cerrado que un tubo de radio. Es mas largo que la esperanza de un pobre. For as long as I can remember, I've always been involved in some form of sales. I began working at a very early age selling clothing and sneakers in local stores on Orchard Street in Manhattan's Lower East Side. They tell me that I was a very out-going and energetic as a child and working in those of stores helped develop my people skills. Little did I know that was going to be my biggest asset in the world of real estate. I was born and raised in the Lower East Side and frequented the local businesses. One night, as I was eating at my favorite spanish restaurant on Avenue D, I came across an old school friend. I asked him how he was doing and he told me that he was a real estate agent and doing very well. He told me that he was driving a Mercedes Benz and had just bought a house in New Jersey! This was the same guy I went to Seward Park High School with! He was doing great and I still didn't know what to do with myself so, I asked him what it took to get started. He went on to explain that becoming a broker involved simply enrolling in a 40-Hour course and passing a 100-question New York State Real Estate Licensing Exam. That night I couldn't sleep thinking about my future. I was never cut out for the 9 to 5 job, nor the typical NYC jobs. In my heart, I knew I had to be my own boss! I could have paid for the 40-hour course and taken the State exam but, I first wanted to get a degree under my belt. So in 1989, at the age of 21, I decided to enroll at the Borough of Manhattan Community College (BMCC) located in Tribeca. In 1991, I graduated with an Associates Degree in Business Management with a minor in Real Estate. The BMCC real estate program covered both the required salesperson & broker's qualification courses. After graduating, I immediately went to the state building on downtown Broadway and took the licensing exam. To my pleasant surprise, I passed the exam with a 98 and was well on my way to becoming a certified Independent Contractor. My next step was to secure a job as a broker; so one Sunday afternoon, I bought the paper and answered several want ads. I found that most of the listings offered training for the position of real estate broker without asking for previous experience. I found the first interview I went to was very laid back. The broker asked me a couple of questions and told me that he could see $$$ in my eyes so he hired me on the spot! That first year was basically a learning experience. However, every year after that was an earning $$$$ experience. I quickly learned that the average agent made between $2,500 to $5,500 per month! 1. You are in partnership with the owners without incurring the office expenses. 3. You have very flexible hours (as long as you produce). 4. There are great tax benefits! 5. There is a 50/50 split on all commissions! 6. There is no limit on income potential. 1. It's a commission-based business. 2. There will be times when you go 2 to 3 weeks without making any money (so always have some cash saved for your basic living expenses). 3. You're responsible for paying your own taxes (so don't spend all of your earnings at once). 4. There are no health or retirement benefits (invest in your own health plan). I consider my 8 year career in real estate a blessing because it has both enriched and fulfilled my family's life. Not only have I have been able to increase my commissions to 60% but I have also assumed the responsibility of managing a rental division of 8 agents. I've also had the opportunity to participate in interviews with the New York Times, The Post as well as several magazines and have done business with many top celebrities in the area of sales and management. Currently I'm in partnership with The Halstead Property Company located at 784 Broadway in the West Village. One fact I find surprising is that there are so few Hispanic people in this field. It shocks me because, as I grew up, there were so many young men and women like myself who could qualify for this opportunity. Hispanics have a wide range of abilities at their disposal that should be tapped into. Those who are entrepreneurial can make a great living for themselves in this booming profession. Touched by the sound of Galway flurries while engrossed in the study of a Ramito décima. I 've pondered our progress from Billie's Strange Fruit to Eddie's La Libertad-Lógico? And studied General Robert E. Lee with the Lees in the back room of their laundry. And savored all their splendor - making me a grateful islander. At a time when my life seemed to focus around playing "stoop" or "Wally-Wally", I really didn't give much thought to the area of New York City that I was growing up in. In fact, my parents made it a point to keep us within our "barrio" as they were raised back in Puerto Rico. Home was a five-block radius and not much more! Of course, that was until they bought me a ten-speed bicycle for my eighth grade graduation! (Big mistake) It was at that point that I began my real exploration of the Lower East Side (which stretched from the Smith Projects-where I grew up-to Alphabet City). 2) Boricuas were not the only people in the Lower East Side. This fascinated me immensely because I loved the diversity. Of course, my childhood was influenced by the 1970's television idealism that portrayed America as being the "Melting Pot" or "Sopita" of the world. To me, the Lower East Side was my own personal sopita and I felt my innate Puerto Ricanness helped to spice it up! However, that idealistic view of mi barrio was often challenged whenever I returned to the land my parents called home: Borinquen. My arrival would always be greeted by the jovial gang of primos, tías, tíos and abuelos that made up my extended family. It was just as exciting, I must admit, as it was frustrating. But primarily, it was great to be around people whom I considered "family." In fact I would say, 99.9% of my blood relatives reside in Puerto Rico. Never-the-less, I felt at odds many times with the culture shock I experienced once I stepped off the plane. I also felt for my hosts because I knew I was no angel from NYC! As for the differences, I slowly learned that my identity was not only Puerto Rican but strongly Nuyorican! Heck, I liked it! It made me feel different and unique. Funny but, when I returned to New York, guess what? That's right... there were two million of us Nuyoricans here! Oh well, so much for my uniqueness as the only Nuyorican. Luckily, this was only a short-term dilemma which I gradually learned to cope with. 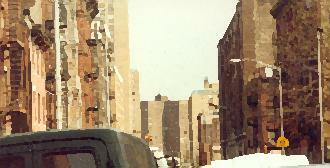 A major grounding force in my life has been the experience of growing up on the Lower East Side. It has been the place where I have felt most accepted as a Puerto Rican, NuyoRican and AnyRican I've wanted to be. In fact, people there seemed to welcome my ideas of "me" as long as I accepted them as they were. Simple? Almost. It took years of practice, but it has become a big part of my value system. What made growing up on the Lower East Side interesting was not only the differences in cultures but religions as well. While a teenager, I got very involved with a youth group in my parish. Our group joined other local Catholic youth groups in organizing retreats under the auspices of the Lower East Side Area Conference (LESAC). LESAC was a Catholic based organization that provided advocacy for the residents of the Lower East Side. As an adolescent, I also had the opportunity to use my energies in projects such as homesteading on the Lower East Side where I learned quite a bit about my barrio as things progressed. I also participated in a volleyball program at the Cardinal Spellman Center, where I met many kids from the neighborhood in team competitions. Fortunately, the Center always provided us with a healthy and safe environment that contributed to our development and progress. In the years to come, that very same group of adolescents would help out by doing volunteer work at soup kitchens, nursing homes and hospitals. We eventually organized (with the help of the adults) to form a theater group that would go on to perform musical productions. What did this all mean to me? Well it has become a huge part of who I am today. Besides being a social worker, I am still an active participant in many political, social, and spiritual areas of life. The truth of the matter is that I may not have been interested or knowledgeable about many of these things today had it not been for the influences that mi barrio had on my life. That sopita called the Lower East Side has left a lasting impression deep in my soul. And even though I don't reside there anymore, it is still an important part of my life. It was where I learned to walk and love. It is where I return to remember that I am not only a NuyoRican, but a true Lower East Sider and human being. I knew that I wanted to be a lawyer from the early age of ten. Since then, I have been called upon by my parents, aunts, uncles and neighbors to translate government notices, negotiate rent extensions, communicate with insurance companies, and complete important applications. I was chosen for these tasks because I spoke English and was among the first in my family to graduate high school. Since then, I knew that I wanted to represent people and help them solve their problems. Regardless of the reason for your interest in a legal career, I encourage you to act on that interest - a career as an attorney is not as out of reach as many people believe. I have written this article specifically to encourage young people from Loisaida to consider careers in the law. Below are my personal thoughts to help you develop a plan to successfully compete for admission to law school. Note, this is a realistic view. The road to law school is not for everyone. You must first decide that you really want it, and then work very hard every day to realize your goal. The good news is that all the tools necessary to enter law school can be learned: Law is not rocket science! The first step for any prospective candidate, whether you are in grammar school or have been out of school for twenty years, is to visualize yourself in law school. This may be difficult if you have no idea what it is like to be in law school. Below I have listed sources of mentors who can help you with this first task. Unless you are able to visualize your goal, it will be virtually impossible to determine the necessary steps to achieving that goal. Goal: You are accepted to XYZ Law School! Let's assume that you are currently in elementary or junior high school. Early on, you must accept the fact that your school work must come first - before friends, before free time, before any other hobbies. Your academic average will determine what high school you will attend. So focus on scoring the best possible grades. Remember, you can still have plenty of free time even after you've completed your work; the trick is to complete it first. By disciplining yourself early on, you will develop important habits that will enable you to do better with less effort later. Commit yourself to excellence now! When the time comes to choose a High School, do not select a school based on your friends' plans. Limit your choices to academic, not vocational schools. I attended Norman Thomas High School. I believe that I learned a great deal there; however, because it was primarily a vocational school, it was more difficult to gain acceptance to college. Since my high school did not offer certain classes that were required for college, I was required to make them up - for little or no credit. Academic high schools prepare students for college; vocational schools prepare students to work after graduation. Regardless of the high school you attend, you may choose to major in any academic subject. Many pre-law counselors advise students to choose History or English. I believe that the study of English is a very good idea. This is because law school applications require you to communicate clearly. Additionally, the ability to communicate is the most important tool a lawyer may possess. So for high school, and later for college, work to polish your writing and reading comprehension skills. One of the best ways to do this is to read a daily newspaper such as the New York Times. Remember, it does not really matter what you study in high school, so long as you attain the highest grades possible. So, it is usually best to study what interests you most. Your college options will be determined by your performance in high school. As noted before, focus on scoring high grades and continue to polish your reading and writing skills. Choose a major that interests you so that you can do well. Introduce yourself to the pre-law adviser on your first day of classes. Begin to lay the groundwork for a strong application. Law schools look for strong analytical ability. Math, science and debate courses can be useful in this regard. Take writing or paper courses to prepare you to write a strong personal statement. Law schools also seek candidates who demonstrate a sincere interest in the law. To demonstrate your interest consider interning with the legislature, a law firm or with a judge while in college or high school. Admissions officers also look for leaders who care about their communities. Consider participating in student government or community service organizations. Your application will also require letters of recommendations from professors who are familiar with your work and your character. Be sure to develop one or two solid relationships with professors. By asking questions and allowing them to know you academically and personally, you will prepare your professors to write effective letters on your behalf. An impressive college grade point average is only one of three key ingredients to law school acceptance - you must also submit a strong application and complete the LSAT. In your senior year of college you must start investigating law schools. There are many choices. I attend Fordham Law School in New York City because it allows me to work in the day and attend class at night. The application process is lengthy so you must begin working on it at least one full year in advance of your anticipated enrollment. Contact your guidance counselor and the organizations below for advice regarding specific schools and the application process. The final hurdle is the Law School Admission Test (LSAT). This exam tests your ability to think clearly and predicts your chances of success in law school. Students should study at least three months to prepare for this exam. You should contact your guidance counselor and the organizations below for advice regarding commercial preparation courses. The road to law school is paved with hard work and sacrifice. In fact, acceptance into law school only extends that difficult path! Law school requires many hours of study and costs tens of thousands of dollars. Nonetheless, thousands of people apply each year because they recognize the many advantages of law school training far outweigh the costs. Our society respects lawyers and entrusts them with broad decision-making authority. Law school trains you to think and communicate clearly. As a result, legal training provides you with a great variety of career options, not only in the law, but in business, government, public affairs, social activism, academia, etc. I hope that my comments demonstrate that no matter what your position in life, if you really desire a career in the law, you can reach your goal. I have enjoyed the coursework and have met many interesting and potentially life-long friends. Although I have made temporary sacrifices, I have spared myself many of the more difficult, permanent sacrifices. As an attorney, I will have greater financial security for myself and my family. As an attorney I will be in a greater position to help people solve their problems. As an attorney I will never have to work as hard as my parents have for an unfair wage. Fordham Law School Latino Law Students Association (LALSA) - provides tours of the school (including the opportunity to sit in on an actual class! ), application counseling and admission to special events where you may meet mentors. Contact Oscar Tobar, Chair of the LALSA Recruitment Committee, at 212.636.6950. Puerto Rican Bar Association (PRBA) - provides law school scholarships, career fairs, orientation workshops, mentors, and resume/interview workshops. Visit the PRBA's web site at www.prba.net or contact the PRBA Student Liaison, William Malpica, at studentinfo@prba.net or 212.447.4444. �Your thoughtfulness was of great comfort and truly appreciated. Gracias por haber estado con nosotros en los momentos mas dificiles.� These are the words I chose to express my family�s gratitude to all the people who attended my mother�s funeral this past February. As I write this it is hard to believe that the most important, influential, and most loved person in my life has been gone for six months. Having experienced the most dreaded of life�s inevitable event�s I learned that without the love and support of family and friends I could not of gotten through this time of my life. A few days after her burial I decided to finally put my new computer to good use by making �Thank You� cards, which I planned to mail out as expeditiously as possible to all those people who I am forever indebted to. In case you were wondering economics played no role in this decision to create my own cards. As a matter of fact, in retrospect, it probably would of been more prudent of me to purchase them at the nearest card shop considering my infamous computer prowess. I mean, the instructions to my American Greetings Create-A Card program seemed self explanatory and easy enough to follow (even for me). Upon the completion of my project, which I must admit was cathartic in many ways (it took long enough), I phoned my sister to inform her of my deed. She shared in my gratitude to those who helped us endure our pain and was eager to get her hands on the cards to forward them to her friends. As I sit here in front of my computer, once again, I am not sure how many of those cards made it into the hands of the people they were intended for. Ironically, this is the first time since I created the �Thank You� cards that I�ve even attempted to write anything having to do with my mother. My family was very impressed with the creativity and choice of words in the cards that were signed �from the P�rez Family� (although I never felt articulate enough to truly express my appreciation). I, too, was happy with the way they turned out, but for some inexplicable reason six months later I realize that I had never mailed out my cards. I remember telling myself that I had some mailing to do , but I never got to them. Denial? I�m not sure why, but I can assure you that I am still indebted to all those who cared enough to share in my pain. Niña: Mami - did you prepare the list of the items you need from the supermarket? Doña Mil: No. I want to go with you. You don't know how to choose the verduras or what to look or at the butchers. You'll buy whatever meat the butcher gives you. Niña: (Under her breath) Yeah right, like you know if it's horse meat or beef. Now I'll have to go straight to the marqueta and walk slowly and take forever in the market. Doña Mil: What? What did you say Meeha? Niña: No, nada Mami, it's just that we must rush if we are going to make it there before they close. Doña Mil: Yes, all this is true, but we did have one thing that you children today do not have. Niña: Oh, and what was that? Niña: Yeah, yeah. Okay, Mami. (Exit from kitchen, arrive at La Marqueta). Butcher: Buenos días, Doña Mileena. How are you? Look at the fresh meats we have here today. Doña Mil: Hola Don Roberto. I am fine. This is my daughter Inocencia. She is here today to learn how to buy the ingredients to make pasteles. Niña: (Almost in a whisper) Mami, must the entire neighborhood know? Butcher: (Laughing) Oh, its alright Inocencia. Just yesterday, my daughter was here with her mother to buy for the Thanksgiving day dinner too. And she is much older than you. Doña Mil: Don Roberto please give me 25 pounds of ...(her voice fading from Inocencia due to her mind being on something else). Niña: (Thinking) Oh, there's Ricardo, I hope he does not see me here. But what is he doing here anyway? (Seen by Ricardo) Hi Ricardo. Ricardo: Hello Inocencia. How are you doin? What's up for tonight? Niña: Oh you know, same old same old. After I help Mama, it's out clubbing tonight. Ricardo: (Enters Doña Mileena) Hello Doña Mileena, I see you are getting ready for your famous pasteles. Doña Mil: Hola Ricardo. Yes, trying to get a head start for the Thanksgiving dinner, and the relatives coming over. Ricardo: Yeah, I know the feeling. I'm here with Mam also trying to get ready. Doña Mil: Oh, where is Doña Petra ? How is she doing? Ricardo: She's fine. She's over by Don Felipe's finishing up her grocery shopping. I'm just going back for her now. Doña Mil: Well, it was nice seeing you. I must run along, there are still several preparations to be done. My regards to your mother. Come along Niña we must move on. Niña: Alright Mami. (Then turns to Ricardo) Take care Ricardo. Nice seeing you. Ricardo: Yeah, maybe we'll see each other tonight. I'm going to Casa Blanca, is that where you're headed to? Niña: Yeah, that's where I'll be. I'll see you there. Ricardo: Hey, save a dance for me. Okay? Hasta el luego. Doña Mil: Niña that boy Ricardo, he seems like a nice young man. Does he know you are interested in him? Niña: Yes, Ricardo is a nice young man, and handsome too. (Giggles) Mami, what do you mean interested in him? He's just a friend. You know that Enrique is my boyfriend. Doña Mil: Well, if I were you, I wouldn't let Ricardo get away that fast. Enrique can't even wipe Ricardo's shoes. He's a loafer, all he does is hang around bongo park all day Ricardo is very polite, he cares for his mother and takes her to the market. He has a good job and even owns a nice car. And he does look interested in you. I mean, he even asked about my pasteles. Enrique, he doesn't even notice half the time when I'm around never mind that I'm your mother! Well, anyway, what do I know, I'm just an old vieja with my achaques. What do I know. Hmmm. The next day, Sunday, some family arrive from Florida and Pennsylvania. Rosalia: Bendición Titi Mileena. I missed you so much. How are you. Look at how big these grillitos have gotten. Doña Mil: Qué Dios me los bendiga. I am fine. Let me look at you all. My, I wouldn't recognize these children if they passed me by in the street, they're so grown. Look at how handsome Manny is, and Margarita, my goodness she is a beautiful señorita. And look at Susy's kids. The last time I saw them, Teby was crawling and Chispa was not much bigger. And look at them now. How I love getting the family together. Come in, come in, rest your bags. Niña will show you which rooms you'll be sleeping in. Settle down, relax, then come back to the kitchen. I'll have something for you to eat, and we can reminisce, joke and tell some tales. Now go get settled. (Exit all chatting and arguing about who sleeps with who. Rosalia and Doña Mileena stay behind talking). Rosalia: Titi Mileena, Que Pasa? Something is troubling you. I can see it in your face. Something worries you. Doña Mil: No, nothing Meeha, I'm fine. (Walks away with her head lowered) Oh who am I kidding, I could never hide my feelings very well. Especially not from you. I'm worried about Inocencia. I'm getting up there in age and I really wish I could be around a little longer for her. Rosalia: Titi, don't talk like that, you still have plenty of years ahead of you. You'll probably see us all go to our graves. Doña Mil: Ay Meeha, God bless you. But I know what I'm talking about. My achaques are catching up with me. Mark my words, my days are numbered. But I don't worry for myself. No, I've already made peace with myself. I only worry for Inocencia. Rosalia: But why? Inocencia is already a woman. She's 22 years old. She can take of you and of herself. She has a steady job, and works hard to get her college degree in the evenings. There is no reason to worry about Inocencia. Doña Mil: Well you know, money isn't everything. I mean, don't get me wrong, I'm glad she's successful in that part of her life. But there are still things she needs to learn. Things about her culture, her heritage where she comes from, who her family was especially who her father was. These are all things that you already know about, things I'm sure my sister taught you as you were getting older. These kids today really don't want to be bothered with their history. They don't realize how important it is to know where you come from. But these things are essential because if you don't know where you come from, how do you know where you're going? I mean, look at you and Susy. You know quite a bit about our culture and that may be because you lived on the Island with your parents; God rest their souls. But look at Susy, she grew up here in the states. Everyone was always so concerned that she wouldn't speak English that even in the house, they spoke to her in English. And what happened? She became so Americanized that she does not even how to cook arroz con gandules y pernil, never mind know how to say it. And her kids, they don't speak or understand Spanish. I mean, English is important especially because we are living here, but one can never forget who they are. One day, one day these children will realize the importance and benefits of both languages, and the richness of their heritage. I just hope it's not too late when they finally open their eyes. Especially nowadays with all the talk about Puerto Rico possibly becoming a State instead of a commonwealth to the U.S. Its a very critical and important time for us Puerto Ricans. Chispa: Titi Mileena, can we go outside to play? Doña Mil: Okay, but only for a little while. You still need to eat and I'm going to need volunteers to help make our traditional turkey shoes. You know we can't have our turkey going barefoot. (The children exit laughing and cheering. In walks Papo). Papo: Titi Mileena, when are your sons getting here? I can't wait to beat them at a game of dominoes. Doña Mil: Oh, Orlando won't be here until Wednesday, and Jose will only be here for Thanksgiving day. You'll probably have to wait until the family returns from the parade on Thursday for your domino game. Unless you don't mind playing with us women. (They all laugh) I'm just teasing, you know the women have to help me with the pasteles. But if you'd like, Inocencia can probably take you over to Jose's house. Inocencia: (Thinking) I know how Mama would've wanted these arrangements to be handled. I was the one that lived with her till the end, not Jose. When I get back to the house I'm going to speak to Rosalia and see what she thinks. Maybe she can help me confront Jose with my plans. Doña Mil: (Looking down from the heavens) Look at my Niña. I was so afraid that she wouldn't keep the traditions alive or be able to handle the responsibilities. But look at her now, she's managing everything. I always knew she had a good head on her shoulders. She let her brother deal with the funeral arrangements, or at least he thought he did. But she had her hand in that too. She always dives into her work to keep her worries away. I think she got that from me. She engrossed herself in making the pasteles alone. She would not let anyone help her. She insisted that everyone go about their business as usual. No one really wanted to go to the parade after the funeral and all, but Inocencia insisted they go. After all, they had come to New York from far and should really take advantage of their time here. And every single moment that she was grating, peeling and cooking, every single second I was at her side. I know she felt me there, and I know she heard my responses when she asked "Ay mamacita what do I do now?" How small do I cut the meat? How much sofrito do I pour in the masa? And step by step by step I would answer her. Rosalia was right. There was no reason for me to worry about Inocencia. My baby became a cultured, sensitive, responsible woman. When did that happen? Now, its time to look for the rest of the relatives I have up here so they can help me with the preparations of the Pasteles. Oh there they are, I didn't have to look far. There's my sisters, and my brother. But wait, what are they doing? It seems they are having their own celebration. Oh, there's a hand made sign. They're celebrating my arrival home with them. And they already have the pasteles made, just like my mom taught us, the same way I taught Inocencia. We are all going to celebrate the Holidays up here, with my other family members. Not all is lost. I was able to fulfill my wishes on earth with my children which was the most important of my goals. I instilled good values in those children, now it's up to them to apply what they learned and keep our heritage alive. Shopping Tip* Ask your butcher to cut the meat and remove the bone. This will reduce your cutting time considerably because you still have to cut the meat into smaller bite size pieces. 1) Wash and cut plantain leaves down to a size of approximately 10 inches long by 4 inches wide. *To wash the leaves simply take a new damp sponge and wipe the leaves down to rid them of residue. Many older Puerto Rican style cooks still prepare the plantains leaves by burning them slightly over an open flame. This method is called martiguar las ojas. Although optional, I recommend that you use extreme caution if this method is used. Remove pork shoulder from bone, cut into bite size pieces then season to taste with adobo (no salt) before placing in bowl (save the bones in a 5-quart pot). Follow the same procedure for the ham but do not season. Place the bowl of seasoned meat in the refrigerator overnight for marination. Next, after placing the left-over bones from the pork shoulder and ham in a 5-quart pot, add 5 cups of water and two chicken bouillon cubes (or two packets) then simmer until a broth consistency is achieved. When the broth has been reduced to approximately 2 cups, let it cool off then remove and discard the bones. Save the broth for La Maza preparation (store in a glass jar in the refrigerator until ready to use). Heat broth in a sauce pan and set aside. a) Fry annatto seeds in 1/2 cup of cooking oil until red color is achieved then strain into a jar and discard seeds (for la maza). b) Additional achiote mixture will be needed as this will be used frequently to line the parchment paper so that the pasteles won't stick. Fry 1/4 cup of annatto seeds in 1 cup of cooking oil then strain and discard seeds (mixture for lining parchment). a) Peeling green bananas and plantains require special care. Start by cutting off the tips at both ends of the banana then slit the peel lengthwise. Next, drop the scored bananas into a pot of hot tap water and remove the peels either with a knife or with your fingers (preferably thumbs). Use the same process for the plantains. After you've finished peeling the bananas and plantains, peel the potatoes and yautia and place the vegetables in a bowl. b) Grate all the above vegetables and mix together in a bowl to make La Maza. c) Add 1/2 cup of Achiote coloring oil to La Maza and mix well so that color and consistency is uniform. Tip* Green bananas should be peeled and grated immediately after purchasing to avoid ripening. If the pasteles cannot be completed the same day, La Maza may be refrigerated for up to 2 days. When removing it from the refrigerator, let La Maza stand at room temperature for about « an hour before mixing it for use. In a large 4-liter caldron, saute 1/2 cup of cooking oil, sofrito, diced onions and olives then add one can of tomato sauce and one packet of sazón. Stir for approximately ten minutes on a medium to low flame. Next, add the cubed meat, stir and cover. Let the mixture cook for about 1 1/2 to 2 hours (stirring occasionally). Now that everything is prepared (La Maza, the meat, and the achiote), spread the items out on a large table along with the parchment paper, plantain leaves, sweet red peppers, additional stuffed green olives, and the pastry string. Keep a large serving spoon in La Maza and a separate serving spoon for the meat, etc. Stack the parchment paper flat out in front of you and keep the bowl of achiote resting on top of the parchment paper (in case of any spills, the parchment paper will absorb it). On top of a parchment sheet, spread out 1 Tbsp of achiote in the center, place a plantain leaf on the center of the parchment paper, thinly spread 1 « heaping serving spoons of La Maza onto the leaf, add one serving size spoonful of meat, one slice of red pepper and one olive. (Optional chick peas and raisins may be used here). Fold stuffed parchment paper in half (lengthwise), now fold over in half again so that empty part of parchment paper is folded down to meat stuffed part of paper. Fold in both right and left ends to center. End result will be a rectangle the size of the plantain leaves. Final step is to tie the pastel with pastry string (see above photo). Continue this process until La Maza has finished. Yucca pasteles are made in more or less the same way as the banana pasteles except that you only used yucca as the vegetable. Peeling Yucca is pretty tricky but if you cut the vegetable down into small pieces and slit the peels, you can easily take the skins right off. After you have grated the peeled Yucca, squeeze out the excess milky water (I recommend the use of a cheesecloth to remove the excess water). The broth from the bones in the previous pasteles recipe is also added to the Yucca Maza. Follow the same steps as in the green banana pasteles recipe (remember, the only difference is the vegetable substitution). *4 Large Yuccas Yield 20 pasteles. Fill a large dutch oven pot half way full with water and add 2-4 Tbsp of salt. Add up to one dozen pasteles then cook for 30-45 minutes (or 50-60 minutes if frozen). Remove the pasteles from the water when cooked and place on a plate. Cut and discard string then open the center of the parchment paper to reveal the pastel. Remove and discard the remaining paper & plantain leaf. You are now ready to enjoy a pastel. Once again, I would like to acknowledge the contributions of this unique group of individuals who have given so generously of their time and talents. As our extended family of friends continues to grow, we also continue to pursue the all-important goal of imparting the knowledge gained from our past experiences in order to give our successors a better chance. A sincere thank you also goes out to the families of our team members who have been so patient and supportive throughout the laborious process of putting this project together. George Arana Jr. is a certified real estate broker in New York City. Helen Arana is a health care worker in New York City. John Cancel is a hospital social worker practicing in New York City. Pard H. Chan is an optometrist practicing in upper New York. José O. González is an Assistant Vice President with a New York based foreign bank as well as a part-time photo journalist. Carmen Martínez (Project Facilitator) is an Assistant Vice President for a New York based bank. William Malpica is a member of the graduating class of 2000 at Fordham Law School. Upon graduation, he will join a New York City law firm where he will specialize in corporate securities law. William Millán (Project Coordinator) is a Social Work Supervisor with the New York City Department of Social Services. Luis Pérez is a guidance counsellor with the New York City Board of Education.